ST. LOUIS (CNS) — The destruction throughout Ferguson left Blessed Teresa of Calcutta parishioner and former mayor Brian Fletcher speechless. 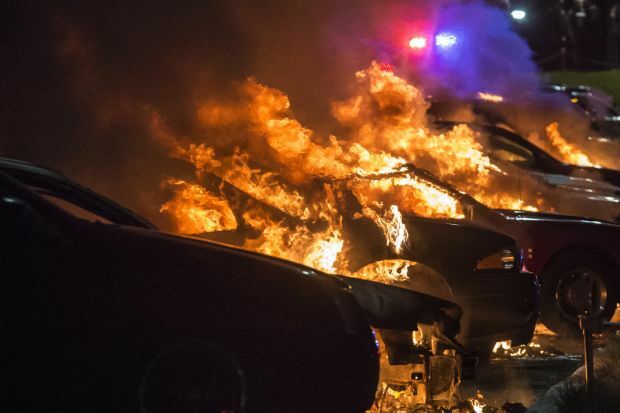 Hours after the Nov. 24 announcement that a grand jury wouldn’t indict Police Officer Darren Wilson in the shooting death of Michael Brown, vandals hijacked protests and violence exploded in Ferguson, overwhelming law enforcement and firefighters. Businesses near three major intersections were looted and burned. Windows were broken at businesses near the Ferguson police department. Firefighters arrived to fight the fires but took gunfire and withdrew for their safety. In all, 21 businesses were destroyed by fire. Father Robert “Rosy” Rosebrough walked through the area Nov. 25, the day after the violence, and quietly blessed businesses and employees, who are now out of work. Among the discussions in the aftermath of Brown’s death, lack of economic opportunity in poor communities has been at the forefront, yet the robbing, looting and arson eliminated the source of employment and economic opportunity for many. Father Rosy drew strength from St. Catherine of Alexandria, a fourth-century martyr whose feast day was Nov. 25. He offered hope, something devoid of many among the protesters upset by the fatal shooting of 18-year-old Brown, an African-American, and the grand jury decision not to indict Wilson, who is white. Protests are ongoing in Ferguson and around the country. On Dec. 1, workers and high school and college students in several cities walked off the job and away from classes to protest. Father Rosy has called Ferguson the “New Bethlehem,” ground zero where change can be made in society by “leaning in,” as he said, and truly listening to the words others are saying. “When we listen to the stories of others, when we hear their pains and frustrations and they hear ours, we discover that we are brothers and sisters,” he concluded. There are good people in Ferguson, whether at Blessed Teresa, nearby Our Lady of Guadalupe Parish, or just people willing to help out. Pro Football Hall of Famer Aeneas Williams, the former Ram who remained in St. Louis after retirement and became a pastor, was among those helping to clean up businesses Nov. 25. Though heartbroken now, Fletcher has hope that Ferguson will rebound from this, just as it did in recent years with massive destruction by tornadoes.